Waist are equipped with hanging ring, PVC material protection, easy to wear. And can carry personal items less than 5 kg in high altitude. 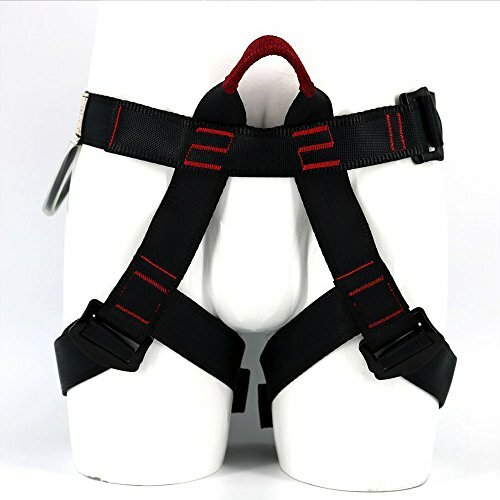 Light weight harness with reinforced belay loop. Good for under high use conditions like a climbing gym,rope course,rock climbing,floor escape, rappelling, mountaineering outdoor guides due etc. 2,Seat belts should be used in conjunction with the connecting ring to ensure that the body swing collision. 3,Keep cleaning, exhausted after use on the ventilation, soapy water can be used to clean, save the temperature at 0-30 ℃. Do not touch the fire and cidic chemicals. Do not collide with sharp objects, not in the sun. Climbing is dangerous. You are responsible for your own actions and decisions. Familarize yourself with this harness's capabilities and limitations. Will fit: waist 24" to 48" ; Leg 16" to 31.5" .One size fit all. Tension≥15KN, Impact force≤6KN. CE Certified. Waist are equipped with hanging ring, PVC material protection, easy to wear. And can carry personal items less than 5 kg in high altitude. Durable bearing loop and agjustable buckles.Metal parts are made of forged steel, outer anodized. Safety and strong ! Perfecting for mountaineering and rock climbing,fall arrest,scaffold,High Work,Fall Protection Hardware,high-intensity environment,outdoor climbing activities, wilderness survival outdoor activities, floor escape,outdoor adventure activities,ice climbing, outward band,fire rescue,working on the higher level,caving,anchoring as well as aspects of disaster relief and so on. If you have any questions about this product by Flowersea998, contact us by completing and submitting the form below. If you are looking for a specif part number, please include it with your message.